The main difference between Gourmia GFD1650 Premium Countertop Food Dehydrator and other food dehydrators in the market is its digital thermostat and te﻿mperature control. You will have the privilege to dehydrate your food precisely with s﻿﻿pecific temperature and a time limit. It will reduce the moisture and preserve 100% food content and will also give you a natural flavor after a long time. ​The Gourmia GFD1650 Premium Countertop Food Dehydrator will provide you a great opportunity to dehydrate any fruits, vegetables as well as prepare some delicious snacks or healthy food items for your family. Unlike other products, this dehydrator has multiple functions which will make your job easier to dehydrate your foods. ​The dehydrator comes with 6 trays, and you can also use 8 trays if you want. These trays are made of hard plastics, pretty easy to clean and most importantly, BPA free. If you are a health conscious person, surely it is a big relief for you to have a BPA-free tray. 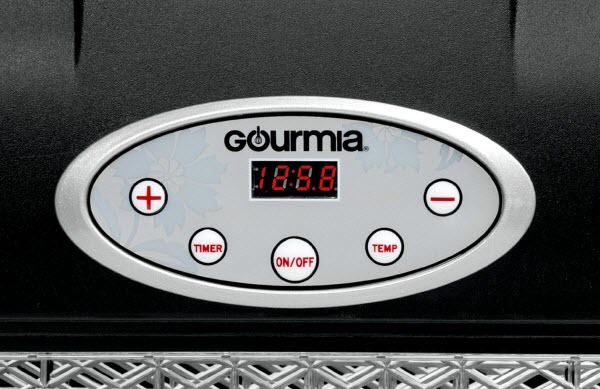 ​The digital thermostat in the Gourmia GFD1650 Premium Countertop Food Dehydrator allows you to continue your dehydration operation in a wide temperature range from 95°F to 158°F (35°C to 70°C). It is adequate for any basic or advance dehydrating as well as preparing any foods. ​One of the greatest and effective features of the Gourmia GFD1650 Premium Countertop Food Dehydrator is its inventive air circulation technique. This dehydrator can flow the air from 360 angles of the trays. It will save your tension to rotate the trees or move the items on the tray. This 360-degree air flow circulation makes sure all your foods are equally dehydrated from every possible angle. ​This product has 8 preset temperature setting which will make your job much easier. The countdown timer will be a great relief from any overheating incident. This dehydrator utilizes the most modern technology to ease your food dehydration. ​People usually get worried about the food value before buying a dehydrator. The Gourmia GFD1650B Premium Countertop Food Dehydrator is a great device which will draw out the moisture from your food items, but it will preserve the food elements 100% like the fresh condition. You are guaranteed to get the proper nutrition, minerals, and other food ingredients just like before. 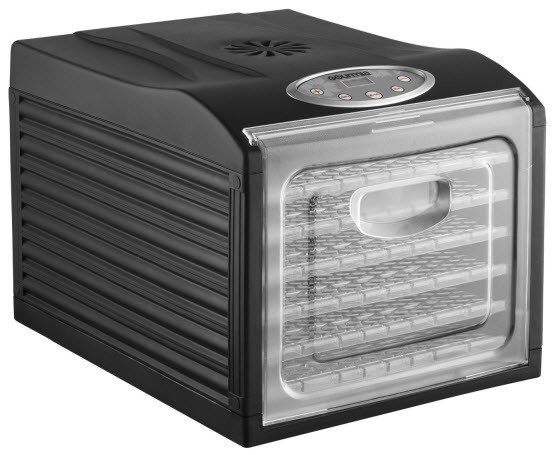 ​The Gourmia GFD1650 Premium Countertop Food Dehydrator has 6 trays as well as adjustable 8 trays. The dimension of each tray is 13”*12”. Each of the rays is capable of holding 1lb equivalent food items. Overall the dehydrator allows you to dehydrate a huge amount of food in one single cycle. This dehydrator has a huge capacity inside, which will allow you to set and removes the trays very easily. It is also very easy to clean up without much stress. ​The fan of this Dehydrator is situated on the top. It is very familiar for its efficient but very quiet operation. Some consumer hears a little humming noise which is 100 times better than other noisy dehydrators. This gadget requires a 400-watt power source which enables it to perform the operation smoothly. ​The Gourmia GFD1650 Premium Countertop Food Dehydrator comes with 1 meet sheet and a solid sheet. A user manual is also provided for your better understanding. The design is eye catching and fits with any kind of countertop. You can avail the product in two different colors, black and white. ​The Gourmia GFD1650 Premium Countertop Food Dehydrator is a stackable food dehydrator which provides you six different selves for arranging your food for dehydration. The marvelous design will allocate plenty of space for your food items equally. ​This dehydrator is different from other dehydrators due to its amazing 360-degree air flow system which allows the food to dehydrate eventually. 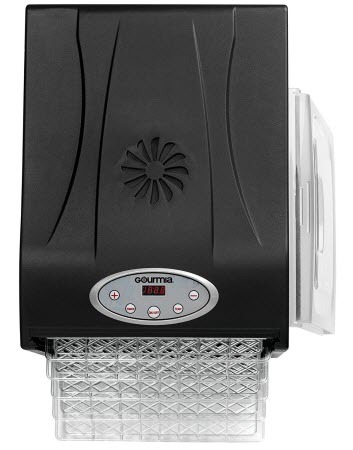 ​The Gourmia GFD1650B Premium Countertop Food Dehydrator has a wide temperature range of 95°F(35°C ) to 158°F(70°C). You can continue any dehydration operation precisely within this range. ​This dehydrator comes with a dimension of 17.6 x 13.5 x 12 inches. The design is great and suitable to any countertop. 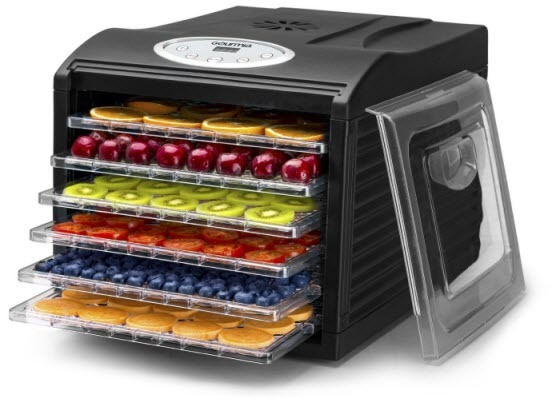 ​The GFD1650 Premium Countertop Food Dehydrator usually have 6 huge trays to arrange your food items. In case you need, you can use 2 extra trays according to your requirement. ​The digital thermostat will notify you about the temperature. It has 8 pre-set temperature mood for more precise operation. ​The product requires 400-watts of drying power to continue. ​The manufacturer offers 1 year of warranty for the product. ​A user guide is included with the product with detailed operation process of the product to save the buyer from any hassle. ​The shipping weight of the product is 13.8 pound, but the product weight is 11.5 pound. ​No need to rotate the food items on the tray, no need to rearrange them. 360-degree air circulation will dehydrate them from every possible corner. This is the best feature of GFD1650 Premium Countertop Food Dehydrator. ​The design is simple, allocates a huge space inside and has two different colors (black and white). It is adorable and can be adjusted with any countertop. ​The thermostat of GFD1650 Premium Countertop Food Dehydrator has eight pre-set mood to give you a better service. The digital timer and thermostat allow you to continue your operation more precisely in any temperature. ​The fan is situated at the top ceiling, and it hardly creates any noise to notice. It is one of the most silent dehydrators in the current market. ​The power capacity of the product is 400 watt which made it very smooth and efficient to perform your desired operation. ​The trays of GFD1650B Premium Countertop Food Dehydrator are 100% BPA (Bisphenol A) free. BPA is a chemical substance which is harmful to human body. ​You will have 6 trays to use, each of them can contain 1lb food item. If you want, you can adjust total 8 trays. It is a huge storage space for any dehydrator. ​Your food will contain all of its nutritious elements and flavors. The dehydrator is famous for its high-quality dehydration. ​Well, as I said earlier, Gourmia GFD1650 Premium Countertop Food Dehydrator is not very pricey, but obviously, you will have to come up with a handsome budget if you want it in your kitchen. Its price range is higher than the usual dehydrators in the market. ​The operation of this gadget is very easy and smooth, but it is not very fast at all. Especially, it will take some time in the very first operation. Later on, the process is slower than the other dehydrator in the market. It is the biggest con of this product. ​Like other dehydrators, it is not very lightweight and not easily portable. It allows you a huge space for dehydrating, so it is a bit heavy about 11.5 pound. ​If you power source is a little far away, you have to use an extension to light it up. The power cord is shorter than the traditional power cord. If you have a power socket right beside your countertop, then it is okay. ​Q. Does it have an instruction manual with it? ​Answer: Yes, you will get an instructional manual with it where you will find all detailed operation. ​Q. Is it difficult to clean up? ​Answer: Not at all. Just dip the trays in hot soapy water, wipe inside and put the trays back. Turn on the machine for a few moments to dry everything up. ​Q. Where is the Fan? Is it noisy? ​The fan is located on the top. No dear, the fan is very silent. ​Q. What is the material of these plastic trays? ​The plastic trays are hard plastic, easy to clean and 100% BPA free. ​Q. Can I wash the trays in the dishwasher? ​No you cannot. It is not that hard to wash it by hand, just use some warm soapy water, sink them in that and wipe smoothly in the fresh water. ​Q. How does the timer work? ​You have to set your items inside, set the temperature and time. The machine will automatically shut itself down as soon as the time is over. ​Q. Will it work on 110V? ​No, it can be operational at 110V only. ​Q. How long is the warranty period? ​The warranty period is 1 year long provided by the manufacturer. ​Q. Can I make fruit rolls here? ​It does not have any fruit leather with it, but the machine can prepare fruit rolls. ​Q. What is the difference between the black and white one? ​I cannot see any difference between them except the color and the price. The dimension and features are same. ​Q. Is drip tray available? ​Yes, it does. You will find one in the bottom. ​Q. How to On/Off the machine? ​There is On/Off switch on the top of the machine. ​Q. Can it prepare beef jerky? ​Of course it can. Just follow a good recipe. ​Q. How to control the temperature, time and humidity? ​You can easily control the time by the timer and temperature from the preset temperature mood. Alas! You cannot control humidity in this machine. ​Q. What is the inside drying space? ​In normal condition, it will allow you 6 square feet drying area. One tray has a dimension of one square foot. You can use 8 trays if you require. A food dehydrator will allow you to have fresh fruits throughout the year without hampering its food value. In this case, Gourmia GFD1650 Premium Countertop Food Dehydrator will be a great assist in your daily life. ​With its marvelous food dehydration capacity, it will preserve all the nutritious elements for you. The timer and the thermostat will; reduce your worry for any kind of dehydration operation. The BPA-free trays will allocate a huge space for you to dehydrate many items together. The 360° air circulation will dry up the items from every angle, you o not need to rotate the foods or trays. ​In a word, Gourmia GFD1650 Premium Countertop Food Dehydrator is a great choice for any food enthusiast, homemakers or any other people who love to enjoy natural food for a long time without any artificial flavor or want to have some healthy snacks without much botheration. Gourmia GFD1650 Premium Countertop Food Dehydrator has reduced the tension and made your dehydrating operation really easy. In our eyes, it is a very good investment.